Allan Pratt, born on the beautiful island of New Providence, is a self-taught Bahamian Artist. At a very early age, he studied the works of well-known Bahamian artists such as Eddie Minnis, Brent Malone and Chan Pratt. After achieving a Special Credit in his G.C.E. ‘A’ Level Art in high school, he put his art aside to pursue a career as a Pastry Chef. During this time, he displayed his God given artistic talents in his Ice and Fruit Carvings and also in his Chocolate, Bread and Pastillage show pieces. Although he has propelled himself to become one of the country’s best Pastry Chefs, he has never lost his unwavering love for art. 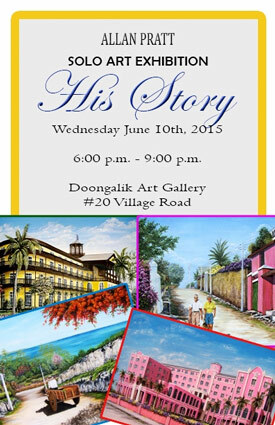 Allan will open his solo art exhibition entitled “HIS-STORY” at 6pm on Wednesday, June 10 at Doongalik Studios Art Gallery on Village Road. The exhibition will feature paintings of well-known historic buildings and street scenes as well as charcoal drawings depicting ‘the family’. The title of the show and the artworks were chosen to remind us, as a nation, from ‘whence we came’. Allan desire through his art is to encourage us to return to those more peaceful times when we were “our brother’s keeper” so that we might heal as a nation in light of the crime situation in our country today. Allan works predominantly with oil paint which allows him the freedom to blend and mesh colors to achieve his desired results. Recently, however, clients have been requesting charcoal portrait drawings and paintings. 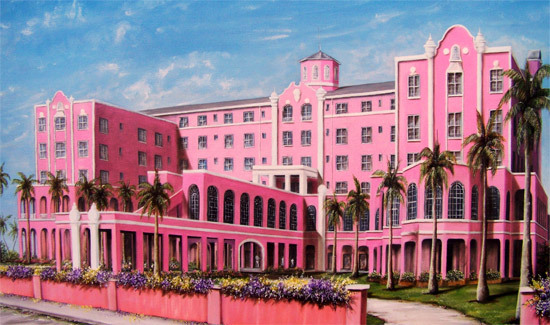 His art can be found in the private collection of several prominent Bahamian Collectors and also private clients in Orlando and Fort Lauderdale. Allan’s goal as an artist is for all those who acquire a piece of his artwork to have their own piece of “Bahamian History” – therefore he does not make any prints, duplicates or giclee reproductions. When Allan says, “you have obtained a piece of my art”, he ensures that it is truly an original just for you. Each art piece also has its own Certificate of Authenticity signed by the artist. “His-story” will be on display until Saturday, July 4. Gallery hours are Monday to Wednesday from 10am to 4pm. For further information contact the gallery at doongalikart@batelnet.bs or telephone 394-1886.